French police have arrested 19 suspected Islamists and seized weapons in a series of dawn raids, President Nicolas Sarkozy told Europe 1 radio. 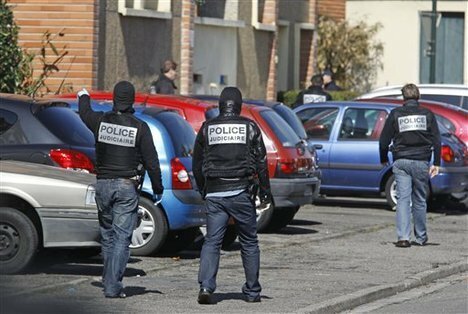 The raids were in Toulouse, the home of gunman Mohamed Merah, and other cities. Mohamed Merah, who killed seven people in three separate attacks, was buried in Toulouse on Thursday after being killed in a shoot-out with police on 22 March. Police have been hunting possible accomplices but sources said there was no direct link with the raids. Mohamed Merah’s brother, Abdelkader, has been charged with aiding him and police are hunting a third man said to be involved in the theft of a scooter that Merah used in all the killings. The raids were carried out by the domestic intelligence agency, the DCRI, with the help of the elite Raid police commando group, Agence France-Presse news agency reports. Several of the raids were in Toulouse, particularly the Mirail quarter, sources told AFP. But there were also raids in Nantes, which is believed to be a centre for the Forsane Alizza (Knights of Pride) group, to which Merah had been linked by some French media. It is a Salafist group that was dissolved by the interior ministry in an earlier investigation. Other arrests took place in Lyon, Marseille, Paris, Nice and Le Mans. Police sources told AFP that some weapons had been seized, including at least one Kalashnikov rifle. After Mohamed Merah’s killings, President Sarkozy ordered police to evaluate the level of danger posed by those known to sympathize with radical Islamists. Nicolas Sarkozy told Europe 1 that arrests of suspected radical Islamists “would continue and that will allow us to expel from our national territory a certain number of people who have no reason to be here”. Nicolas Sarkozy is in the midst of a presidential election campaign, seeking a second term in office in the polls on 22 April. An opinion poll late on Wednesday suggested Nicolas Sarkozy was now ahead of main challenger Francois Hollande in first-round voting intentions – by 30% to 26% – and had narrowed Hollande’s lead in the largely expected run-off vote on 6 May. Mohamed Merah, 23, was buried at the Cornebarrieu cemetery in Toulouse on Thursday. His body was accompanied by around 15 men, although it was not clear who they were. Toulouse’s mayor had said it was “inappropriate” for Mohamed Merah to be buried there, but Algeria, where his family is originally from, had refused to accept his body. Mohamed Merah died in a police assault on his flat in Toulouse on 22 March after a 32-hour siege. He had killed three soldiers in two separate attacks before shooting dead three children and a teacher at a Jewish school. Mohamed Merah is said to have told police he wanted to avenge Palestinian children and to attack the French army because of its foreign interventions.